Thanks to their lightweight design and high energy densities, lithium-ion batteries have become the dominant rechargeable battery on the market. Over the years, we’ve watched the use of these batteries evolve from portable electronics, like phones and laptops, to higher-power applications for electric vehicles and aerospace technology. Along the way, certain design challenges have emerged. A major concern, which we talked about in a previous blog post, relates to the safety of these devices, which overheat and catch fire in some cases. 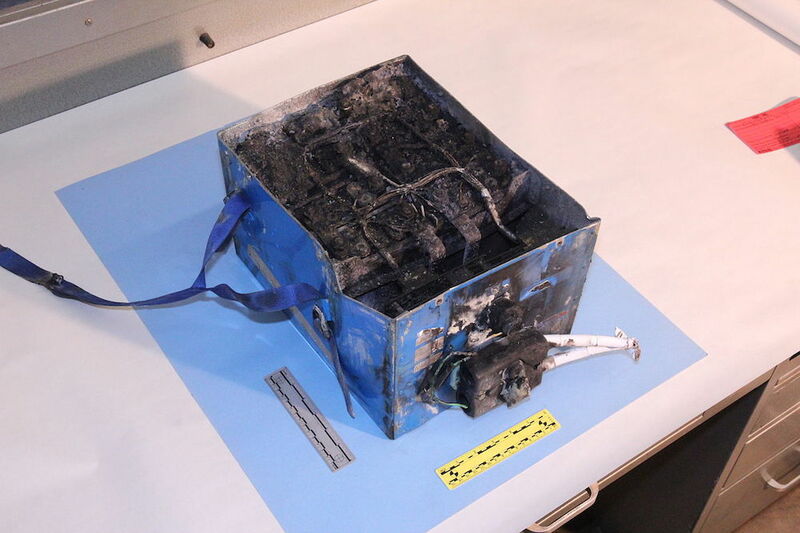 An example of a lithium-ion battery that has caught fire. Image in the public domain, via Wikimedia Commons. 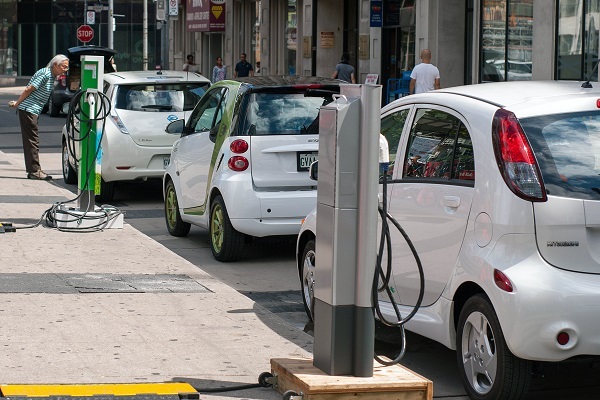 A 2015 article from the U.S. Department of Energy discusses one way to combat such hazardous effects: replacing the traditional lithium salt-containing liquid electrolyte with a solid electrolyte that conducts lithium ions. Making this design adjustment removes the flammable solvents typically found within the liquid electrolyte. And without the liquid electrolyte, there is greater freedom in the battery’s design, which opens new doors for advancing modern battery technology to meet growing demands. With continued development, solid-state lithium-ion batteries could be used as power sources for portable electronic devices and electric vehicles. 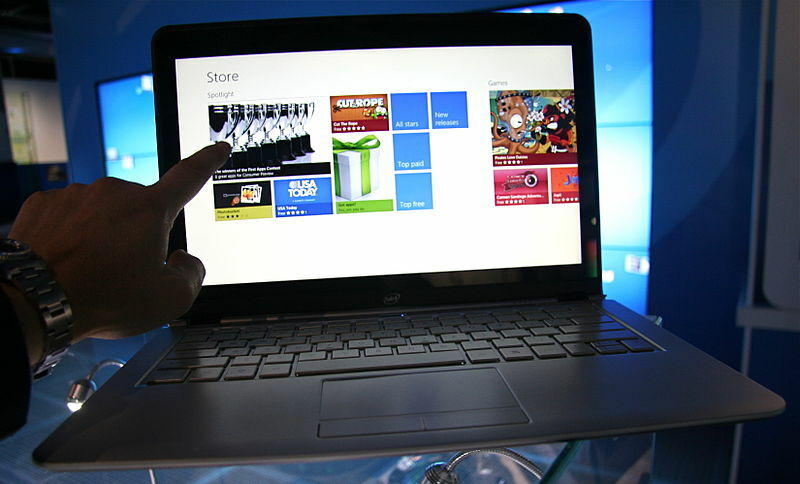 Left: A touchscreen laptop. Image by Intel Free Press. Licensed under CC BY-SA 2.0, via Wikimedia Commons. Right: Electric vehicles. Image by Mariordo. Licensed under CC BY-SA 2.0, via Wikimedia Commons. Strides are already being made to optimize the design of solid-state lithium-ion batteries for industrial applications. For instance, several studies have been conducted to analyze the material properties of a solid electrolyte. The main disadvantage of a solid electrolyte is that its electrical conductivity is vastly lower than that of a liquid electrolyte. Fabricating solid-state lithium-ion batteries through thin-film methods has been shown to help combat this issue. Another important step is to gain a better understanding of the electrochemical processes that occur within these devices. 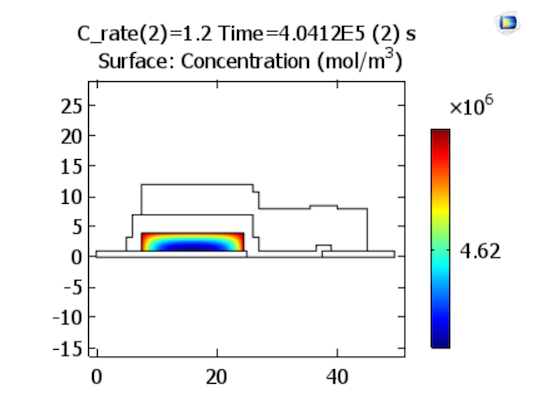 To meet this need, Lizhu Tong of Keisoku Engineering System Co., LTD designed and analyzed a solid-state lithium-ion battery using the COMSOL Multiphysics® software. 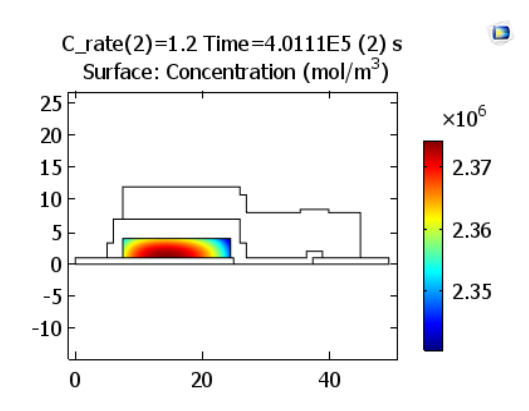 For his simulation study, Tong created a 2D model of a solid-state lithium-ion battery. The model features a negative electrode that is comprised of metallic lithium (Li) and a positive electrode that is comprised of lithium-cobalt-oxide (LiCoO2) film. For the electrolyte, a solid-state lithium-phosphate (Li3PO4) film is used. A cross-section schematic of the model and a figure depicting the lithium ion (Li+) transport within the device are shown below. A cross-section schematic of the battery model (left) and a diagram of the Li+ transport in the solid electrolyte (right). Images by Lizhu Tong and taken from his COMSOL Conference 2016 Boston paper. Note that in solid-state lithium-ion batteries, all of the electrochemical reactions occur at the interface between the solid electrolyte and the solid electrodes. No liquids or porous electrodes are included in the design. During the charge process, oxidation reactions take place at the positive electrode’s surface and the generated lithium ions travel to the negative electrode. During discharge, reduction reactions take place at the positive electrode’s surface that consume the lithium ions obtained from oxidation at the negative electrode. 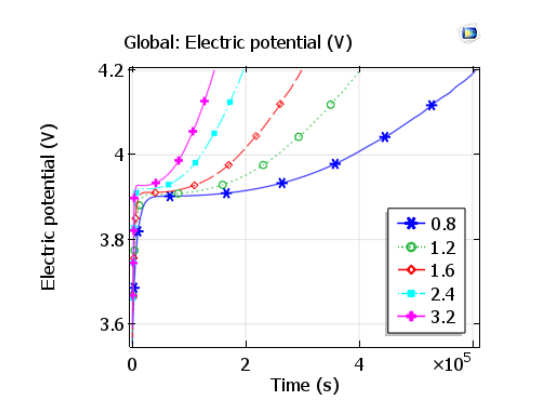 A tertiary current distribution was calculated for the battery, considering the lithium species mass transport as contributing to the overall current-voltage relation for the battery. In the solid electrolyte, the combined diffusion of ions and migration of ions in the electric field were described with the Nernst-Planck equations. In the positive electrode, Fick’s law was used to describe the diffusion of intercalated lithium atoms. Butler-Volmer kinetics were used to describe the electrode reactions at the two electrode-electrolyte interfaces. The solid lithium (negative electrode) domain itself was not included in the calculations, because the metallic lithium is highly electrically conductive compared to the other solid-state materials and there is no chemical mass transport inside the lithium metal. Let’s begin by looking at the charge characteristics for the battery model. Here, we can see the lithium-ion concentrations in the electrolyte at the end of charging steps at rates 1.2 C and 3.2 C. The results indicate that for higher charge rates, a higher gradient of lithium ion concentration is established across the solid electrolyte, so there is greater concentration deviation from the initial uniform ion concentration. Lithium ion concentrations in the electrolyte at the end of charge. 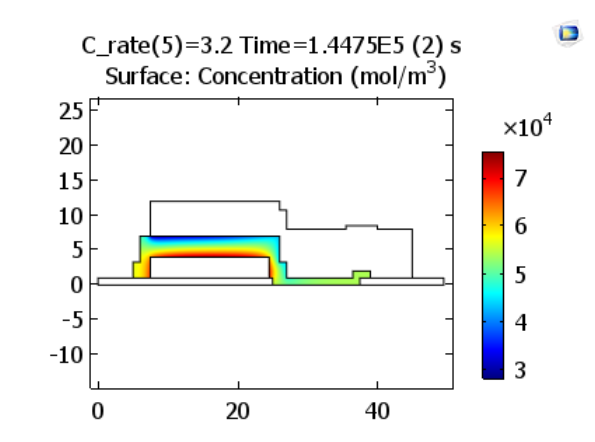 The plots represent charge rates of 1.2 and 3.2 C, respectively. Images by Lizhu Tong and taken from his COMSOL Conference 2016 Boston paper. The oxidation reactions during charging cause the lithium concentration in the positive electrode material to decrease near its interface with the solid electrolyte. Lithium concentrations in the positive electrode at the end of charge. Images by Lizhu Tong and taken from his COMSOL Conference 2016 Boston paper. 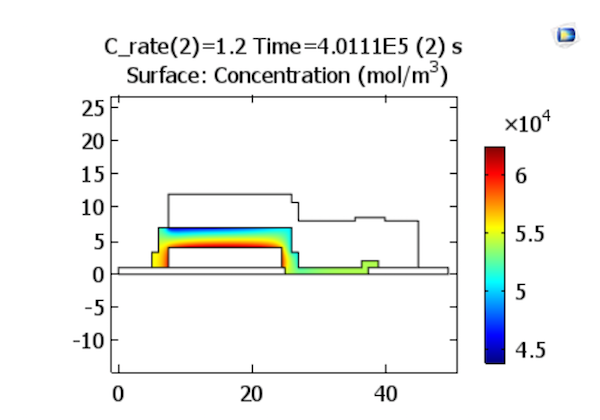 The plot below compares the charge curves — in other words, cell voltage vs. time — for a range of charge rates. It is shown that after charging begins, the cell voltage initially experiences a rapid increase until it stabilizes at about 3.9 V. After this point, further increases in the voltage occur in proportion to the state-of-charge, so that the cell voltage increases more rapidly for higher charge rates. 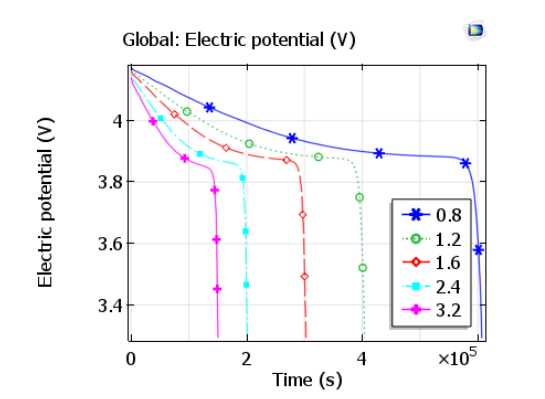 These charge curves could be compared to experimental data to validate the simulation model and further investigate the relation of the battery design to its performance. 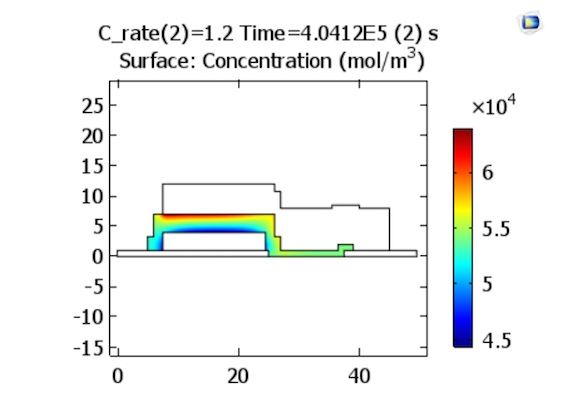 Plot comparing charge curves for various charge rates. Image by Lizhu Tong and taken from his COMSOL Conference 2016 Boston paper. Shifting gears to the discharge process, we can now look at the results for the same corresponding discharge rates. 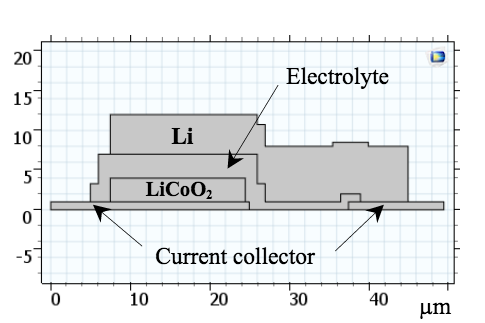 At the end of discharge, the concentration profile across the solid electrolyte appears similar to that at the end of charge, but with the regions of high and low concentration reversed, since the lithium ions diffuse in the opposite direction. 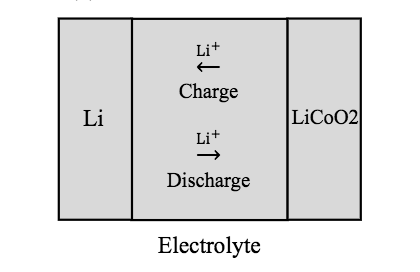 Lithium-ion concentrations in the electrolyte at the end of discharge. 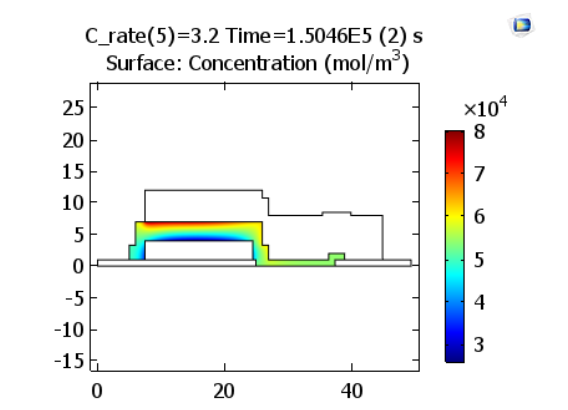 The plots represent charge rates of 1.2 and 3.2 C, respectively. Images by Lizhu Tong and taken from his COMSOL Conference 2016 Boston paper. Lithium ions are now reduced from the solid electrolyte at the positive electrode’s surface, resulting in an elevated concentration of lithium close to the interface of the positive electrode with the solid electrolyte, as illustrated below. Lithium concentrations in the positive electrode at the end of discharge. Images by Lizhu Tong and taken from his COMSOL Conference 2016 Boston paper. The cell voltage drops from over 4 V to about 3.8 V during discharge. Once the battery approaches a low state-of-charge, internal losses mean the discharge current can no longer be maintained and the cell voltage falls rapidly. Of course, this occurs more rapidly for higher discharge rates. Plot comparing discharge curves for various discharge rates. Image by Lizhu Tong and taken from his COMSOL Conference 2016 Boston paper. Solid-state lithium-ion batteries have the potential to address many of the safety concerns surrounding traditional lithium-ion battery designs. 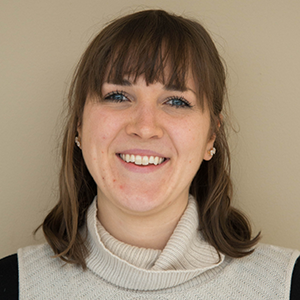 But realizing their application on an industrial scale requires a deeper understanding of the underlying electrochemical processes that occur within the device. 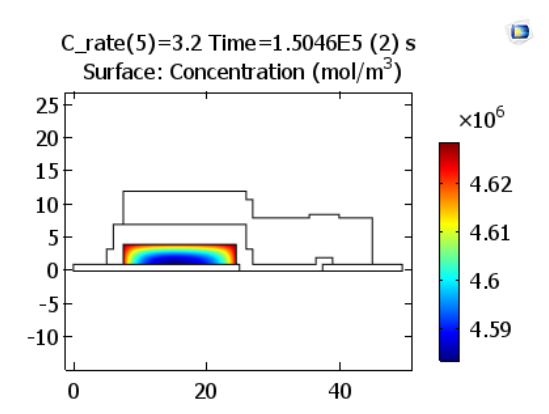 As we’ve showcased here, COMSOL Multiphysics provides you with the features and functionality to model such processes and delivers useful results that can further the development of solid-state lithium-ion batteries. Nice work. Just wondering if there are no moving boundaries/domains as the simulation proceeds? In the case where Li electroplating is occurring for example. In the simulation reported in the paper, the moving boundary effect is ignored for simplicity. However, you could choose to model this in COMSOL Multiphysics if it’s important to the study. 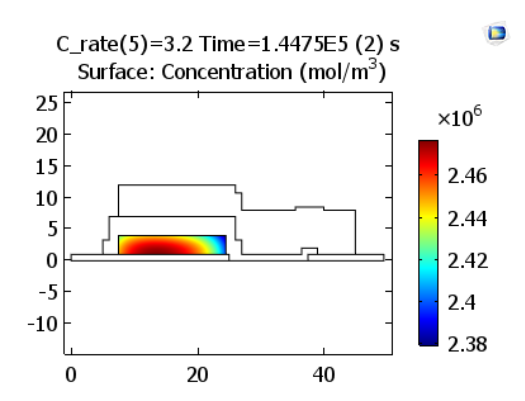 The Electrodeposition Module features a few examples of plating with deformed geometry, which you can browse in our Application Gallery: https://www.comsol.com/models/electrodeposition-module. If you are looking for more detailed advice, I’d encourage you to contact our support team.